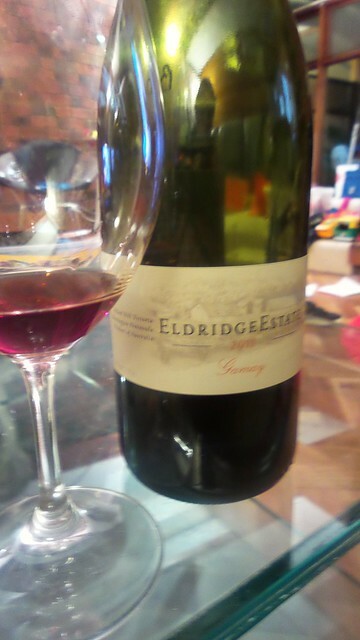 Gamay from Eldridge Estate on Victoria’s Mornington Peninsula. Purchased at auction for silly cheap. The current release (2014) is sold out but was $40. It’s probably been well established that I love buying wine at auction. On the one hand, it is fraught with danger but if you can handle disappointment, it is also a great way of trying new producers. 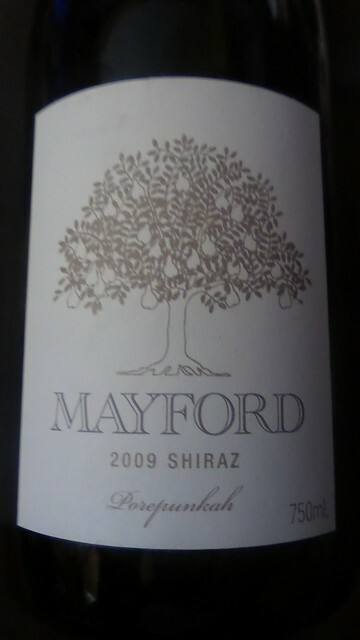 I’m on a good run at the moment – after my discovery of Mayford, I’m pleased to report that this wine from Eldridge Estate (not to be confused with Eldredge in Clare …) over delivers and gives me another winery to keep an eye out for. Gamay is the grape of Beaujolais and it is not often found in Australia (Wine Grapes says around 20 producers). Generally accepted wisdom is that the wines it produces are mostly best drunk young – so a 2011 from an unknown producer required a small leap of faith on my part. If you are familiar with Beaujolais, this wine is much more in line with one of the cru wines, than the entry level Beaujolais or Beaujolais-Villages (not that there is anything wrong with either of those). If you’ve never tried Gamay before, I recommend finding a bottle of the Georges Duboeuf Beaujolais-Villages, which you should be able to find at around the $20 mark. These wines are more red fruit focussed than today’s wine, but they are a very solid and reliable introduction to both variety and style. Elsewhere, you will find small amounts of Gamay grown in cooler climate areas, such as Germany, England, Switzerland, Oregon and Canada. Very pale and definitely garnet in colour. On day 2 the nose is not looking quite as attractive as day 1 – but it is still pronounced, black cherry, some tobacco, leather, a touch of anise and black olive. The palate is less fruit forward – there is some stalkiness which I personally find quite attractive – and it’s backed up with some black cherry and cassis. There’s good acidity and tannins are, as expected, very soft. It doesn’t look as good on day 2 as it did on day 1 (hmmm, perhaps I should have been more forthcoming in sharing with Andy yesterday …) but I will most definitely be on the look-out for more wines from this producer and more Australian (nay, even Victorian!) Gamay in general. 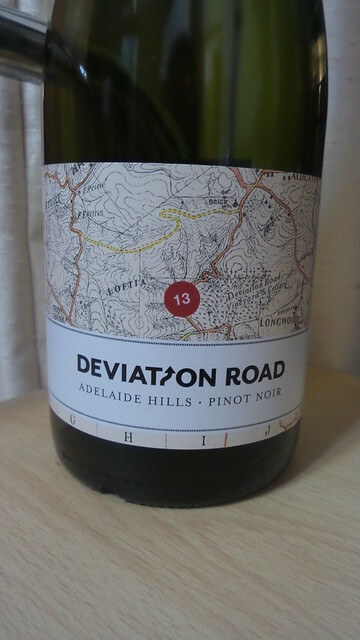 Pinot Noir from the Adelaide Hills, produced by Deviation Road. Sample. Retails at $45. Full disclosure – I also sell this wine. None. This is good wine! You need no excuses to drink it! Tasting note written on day 2. Pale and almost garnet in the glass. The nose is actually reasonably pronounced. It’s very perfumed – there’s a definite breeze of fresh rose petals – and then fresh red berry fruit, in particular strawberries and raspberries. On the palate, plenty of fresh red berry fruit – it’s juicy and luscious. The tannins are fine and velvety and there’s good acidity too so it feels beautifully structured. There’s a touch of perfume here too and in the mouth the wine develops a subtle savoury edge. Excellent length. In the glass, a really quite intense gold. If you didn’t know better you might think it a dessert wine. The nose is quite pronounced and has more than a touch of sherry about it. I was a bit worried at first – but there’s a touch of toast and honey that comes through and a fine line of citrus, so I held my breath (metaphorically) and took a taste. 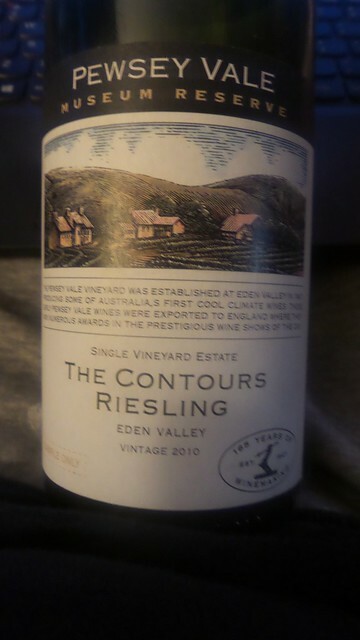 On the palate – toast, honey and grapefruit and even lemon sherbert, and a really pleasing pithy character. The acidity is lithe and persistent, pulling all those flavours along with it. The wine has a really nice textural quality. It is showing a touch of (what I suspect to be) oxidation but not enough to annoy more or prevent me from enjoying this wine. Coming from Watervale, it goes without saying this wine is bone dry and rather steely in character. Yet again, proof that Riesling ages splendidly. It might be an acquired taste but it’s a taste worth acquiring. And one that your wallet will thank you for. Shiraz from Victoria’s Alpine Valleys, by Mayford Wines. Purchased at auction, not readily available (current release is $40). I bought this wine knowing nothing about either Mayford or Porepunkah. The price was right and it had some good reviews. I still know next to nothing – although I am at least now across the fact that Porepunkah is in the Alpine region of Victoria. Near Bright. Which is near Mt Hotham. And I like skiing. This bodes well as I have a weakness for cool climate Shiraz. In the glass, super intense. If a wine could be pitch black this would be it. It’s a youthful dense cross between ruby and purple. The nose is pretty pronounced. Fresh black fruit, black olives, peppery spice and even some licorice and fresh tobacco. All that black fruit is on the palate, blackberry jubes, peppery spice, just like the nose. It’s full and weighty and structure is amply provided by acidity and fine tannins. This is absolutely delicious with plenty of life left in it. If I had case loads I’d be gobbling them up though because that’s just how I am. The current vintage of this wine looks to retail for about $40 and if it looks anything like the 2009, it’s money well spent. I see plenty more Mayford and Alpine Valleys Shiraz in my future. 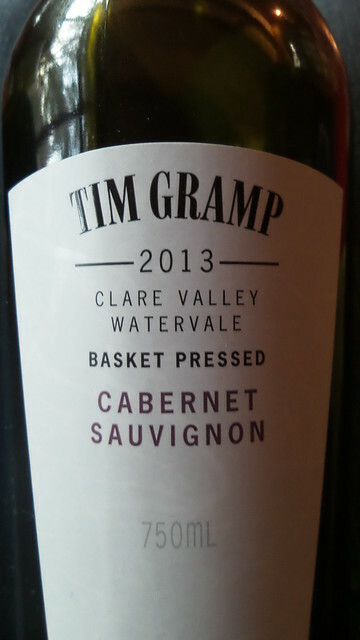 Watervale Cabernet Sauvignon from Tim Gramp. Purchased at the cellar door, $23. 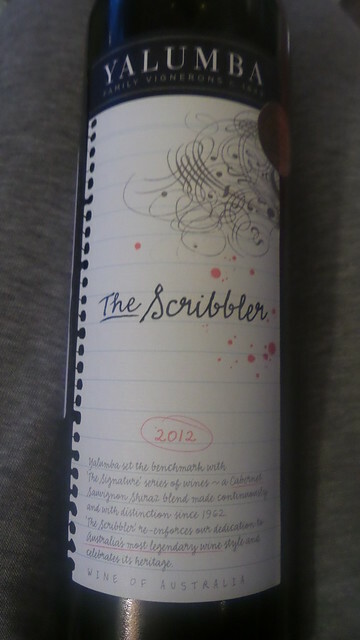 I bought this wine at the cellar door when we were up in Clare for the Gourmet Weekend last year. I spent the Saturday ‘working’ and Andy & I stayed overnight, allowing us a leisurely drive home on the Sunday. My first pro tip is that if you’re heading to the Gourmet Weekend this year, you probably should have already booked your accommodation. Definitely don’t leave it til a week or so before! I’m not a huge fan of crowds when I’m trying to taste wine so on the Sunday morning, after breakfast, we decided to seek out a winery that wasn’t participating in the main activities. 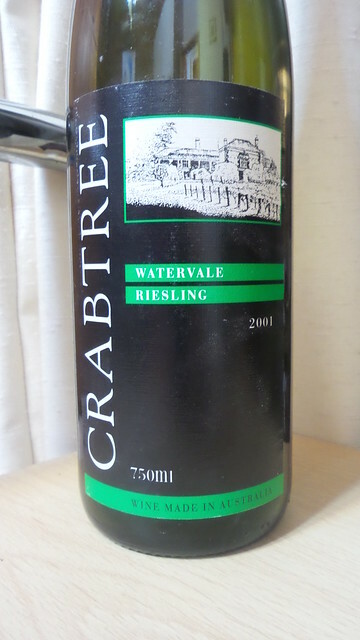 I’d first visited Tim Gramp when I was in uni and a bottle of Riesling purchased then was one of the (sadly few) wines that survived my nine year sojourn in the UK. I have a soft spot for these wines so I was happy when we arrive at the cellar door about 10 minutes before opening and the crowds well and truly elsewhere. The Riesling was sold out but the reds were impressive – we tasted the Tempranillo, Cabernet Sauvignon and Shiraz (no Grenache on tasting, if I recall correctly). We bought a mixed case. I suspect it’s all more or less drunk. The combination of price point and quality is compelling. In the glass, its colour is intense and incredibly youthful. While not purple, its dense ruby is definitely on the purple side! The nose is pretty pronounced but doesn’t have the overt cassis which you’d commonly associate with Cab Sav. There’s black berry fruit along with leafy, stalky characters. There’s licorice too. The palate shows an abundance of juicy black fruit and is much more blackcurrant-y than the nose. There’s good acidity, the tannins are definitely there but they’re not brutal and lovely length. The wine rounds off with a delicious hint of vanilla. Despite the high alcohol, it’s well integrated and doesn’t stand out at all. 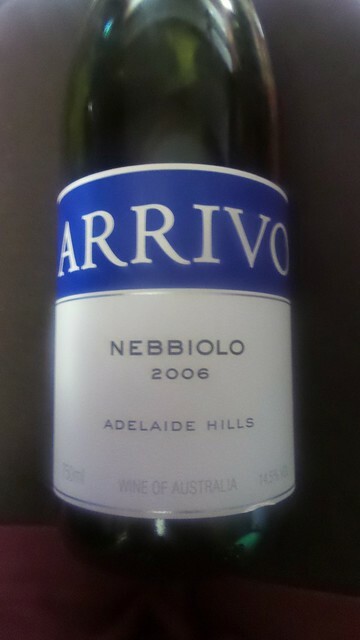 I’ve been in love with Arrivo Nebbiolos since first tasting them at a wine tasting shortly after we returned to Australia. Nebbiolo can be challenging to drink (all those tannins!) and to make. It’s rarely cheap. Pale and garnet-brown in the glass. Think washed out red-brown bricks. The nose is not particularly pronounced and there is very little in the way of fresh fruit (there’s a surprise). Rather, things are all about fresh and dried tobacco. It’s very savoury – there’s some cedar too – but there is a touch of dried rose petals too. The palate is also savoury and the tannins have softened to being pleasantly chewy. Acidity is good and the wine has decent length although there’s not a lot in the way of development. I’m really conflicted by this wine. I’ve been lucky enough to try various vintages of both this and its serious older sibling, the Lunga Macerazione, in the past and unreservedly loved them. Halliday, on tasting this wine in 2014, raved about it and put a ‘drink by 2020’ on it. And I got this out of the cellar to celebrate a special occasion. And yet … I’m not in love. In my mind, did I big it up way too much? Undoubtedly. Having bought at auction I can’t be 100% confident that it’s spent its life stored perfectly. And not having had the luxury of tasting the same vintage year in year out, I can’t be sure that it’s not just hit a bit of a flat spot. Will this stop me buying these wines? God no. Next time, I’ll ensure I come to the wine with no preconceptions and no expectations and I’ll probably be blown away! Barossa Valley Cabernet Sauvignon (54%) & Shiraz (46%) from Yalumba. Oh, there is none. Finally some cool weather in Adelaide so finally I want to drink some red wine! In the glass, moderately intense and sitting somewhere between purple and ruby in colour. The nose is reasonably pronounced with lots of mostly black berry fruit: blackberries and cassis. There’s a touch of something minty and stalky which gives it some extra interest. There is a bit of warmth showing too. In the mouth, lots of juicy black fruit with some good acidity and some well structured tannins. The length isn’t bad either but there is some warmth from the alcohol. The flavour profile is a little too straightforward for me to get overly excited about so I’m unlikely to rush out and buy a case. Having said that, I’d consider ordering a glass from a wine list or, indeed a whole bottle if it was a big table. This is absolutely a wine that will have very broad appeal – and rightly so. Right – after a brief flutter with regular posting, I lapsed back in to old, poor habits. So I’ve decided the only thing I can do is write a blog post as I write a tasting note. This might mean greater brevity but maybe less waffle is no bad thing. In fact, I suspect fewer words and more posts will be a good thing. This wine has been in the wine fridge for a while – you’ll note I received it as a pre-release sample – but it is released with five years bottle ageing. As someone who loves Riesling with age (I just added a 2001 wine to my ‘to drink’ list) I approach this wine with those biases well and truly intact. In the glass the wine is starting to show a little gold but it still looks young and fresh. The nose is reasonably pronounced and shows plenty of the rich kero character for which aged Riesling is renowned. There’s toast, honey and lime too. The palate is a little more austere – acidity is vibrant and persistent and it shows lots of lime topped off with lemon curd with a medium-light mouthfeel. There’s a touch of honey about it – something I can’t quite put my finger on but along the lines of honey on slightly burnt toast. The palate is really dominated by the citrus and the length is excellent. The acidity really pulls on the flavours of the wine and draws them out so it does evolve in your mouth. The finish also has a really interesting textural element – somewhere between (the over-used) minerality and lemon pith. Of course, there is no need to drink this wine in a hurry. Store it correctly for another 5 or 10 years and if you love aged Riesling you’ll most likely be rewarded. It’s a sad fact that if you wait 5 years you may well be able to pick this wine up for a song at auction. I promised you some more bubbles before the new year kicked in and I’m only just managing to squeeze this in. Appalling form but I suppose that at this time of year it’s to be expected (unless I were one of those people who wrote blog posts months in advance and scheduled them all … maybe one day!). A few weeks back we were out for dinner vaguely near Belair Fine Wines when Andy suggested we drop in to have a look. While having a little wander, my eyes lighted on these Honey Moon bubbles. I am a HUGE fan of the Honey Moon Shiraz and Pinot Noir so I was keen to try this out. 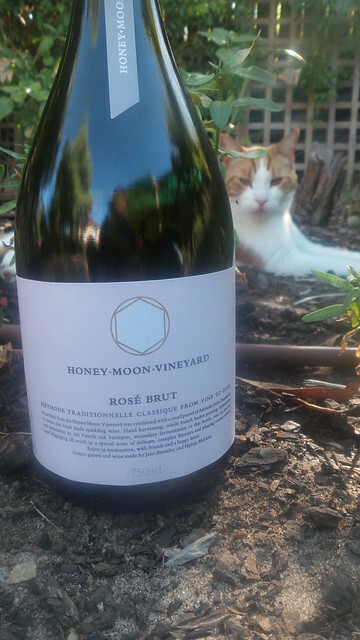 The Honey Moon wines aren’t cheap – they all (bar the still rosé) seem to hover between $40 and $50 so you may need to save them for special occasions. When it comes to bubbles, in my opinion, ‘special occasion’ is generally ‘day with a “y” in it’! After the experience of both this and another rosé sparkling, I really think these are wines I am going to have to drink more often because I’ve really enjoyed them, perhaps a little bit above and beyond white bubbles. This wine is predominantly Pinot Noir – just 13% Chardonnay. The wine is also disgorged on demand – on the side of the bottle it notes that it was disgorged for Belair Fine Wines in September 2014. The theory is that while the wine rests on the yeast lees it remains fresh, vibrant and young and takes on aged characteristics much more slowly Once disgorged, the ‘regular’ sparkling wine ageing process kicks in. Indeed, Bollinger, one of Champagne’s well-known houses, has trademarked ‘RD’ (neatly, ‘recently disgorged’ in English but really ‘récemment dégorgé’ in French), which it uses on one of its (more) premium wines. Another good thing about this wine is that it arrives in your hands topped with a crown seal. You won’t have to spend time messing with the muselet and lacerating your hands and then breaking the Ming vases when the cork explodes out. Just locate the bottle opener and you’re good to go. I really wish that more sparkling wine came under crown seal – after all, it is what most of these wines are sealed with while they’re ageing, AND it’s easy to open. So – ticks all round for this wine. If you can find it – it’s definitely worth investing in. Salmon pink in colour, with a reasonably pronounced nose showing strawberries and cream, a hint of talciness and citrus. On the palate, the mousse is incredibly fine and mouth filling. The citrus character is a little more dominant and I suspect it is beefed up by the wine’s excellent, and very persistent, acidity. But this wine is all about strawberries and cream and mixed red berries. Anyway, ’tis the season to be jolly and drink bubbly so I’ve got a couple of sparkling reviews lined up for you. I’ve decided to start with this, the Jansz Vintage Cuvée 2010, in part because it was a sample and I do try to review samples promptly but also because Jansz’s NV offering is such a well known wine. I suspect many people will not even be aware of the other wines in this range. You may be aware that a vintage sparkling wine (or Champagne) is made from grapes from a single vintage (that is, the grapes are all picked in one year, the year that appears on the bottle). This means that you should see variation in the wine between one vintage and the next (whereas with a non-vintage – NV – wine it is likely to follow a consistent house style). Vintage wines are often (necessarily) made in smaller quantities and this is reflected in their price. Indeed, in France, Champagne producers are obliged to age the wines for longer so this increases the price further. This wine has had four and a half years ageing on the yeast lees so you should see plenty of yeast character in the wine. It is 51% Pinot Noir and 49% Chardonnay. Pale gold in the glass, the nose is quite pronounced and shows apple and citrus, some smoke and spice and even verges towards a talcy character. There are, unsurprisingly, yeasty notes. In the mouth, the mousse is beautifully fine and mouth-filling – straight away you feel like you’ve got a mouth full of teensy-tiny bubbles. The wine is very apple-y, with green apple skin but also some good yeast and brioche characters. The acidity is good (always essential in sparkling wine – it’s what makes it refreshing!) and the wine has good length. This wine is lovely and would work really well with seafood – think oysters, scallops, prawns – fresh and not messed with too much! For me the highlights were the lovely mouthfeel – the explosion of fine bubbles – and the extra complexity. Definitely a step up in the sparkling wine stakes and if you’re going to splash out over Christmas then this is worth a look. While the RRP is $46.95 the chances are that if you do some research you will find it more cheaply. I spotted it at under $40 – a very compelling price point. And props to the marketing people for the “méthode tasmanoise” strapline! 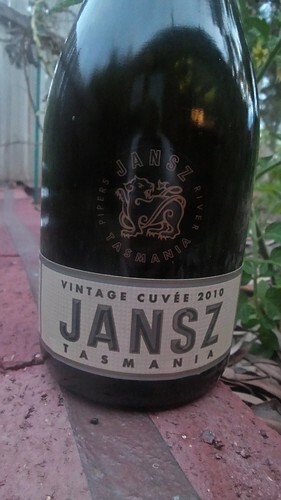 Jansz Vintage Cuvée 2010, sample. RRP $46.95. Cork (standard sparkling wine closure).